If you're itching to explore the Black Cuillin, but put off by the range's fearsome reputation for stomach churning exposure, sheer cliffs and knee-trembling drops, fear not for help is at hand. Not all of the jagged peaks are quite as difficult as the Cuillin's hardy reputation suggests. One, Bruach na Frithe, is actually pretty easy for the average hillwalker with no scrambling or rock climbing required. Add to this the fact that it offers some of the most spectacular views over its sister mountains, and it's an ideal introduction to one of the wildest, most alluring mountain areas in the UK. An ideal base for Cuillin exploration is Sligachan, about 12 miles south of Portree. There's an excellent hotel and restaurant here, and a well equipped, if midge-ridden campsite, just across the road. Set off from the hotel, west up the A863 road to Dunvegan. This climbs through a cutting and, about half a mile from the hotel, there's a track on the left leading to Alltdearg House. If you're driving, you can park your car in a roadside layby at this spot. Follow the track south towards the neat, whitewashed cottage and, as you near, a sign points the way off along a path on the right. Boggy at first, this climbs at a reasonably easy gradient along the north side of the Allt Dearg Mor and there are some delightful little pools and waterfalls to add interest. About three miles up the path, which leads ultimately through the Bealach a'Mhaim to Glen Brittle, you reach a junction complete with cairn. Turn left here, crossing the burn, and the way climbs over open moor into Fionn Choire. On a clear day, the way is easily followed here with small cairns dotted about every so often. However, the SMC Munros guide voices a note of caution, warning that the featureless terrain can cause potential problems in bad visibility. The path rises up into the bowl of the coire which is surprisingly green for the Cuillin, the reason no doubt why you'll find sheep grazing here rather than in some of the area's bleaker, stone-strewn coires. The path follows a rocky streambed up on to scree and you'll experience some wonderful echoes up here, as we did when my dog decided to hold a lengthy conversation with himself. The gradient becomes increasingly steep higher up, climbing over rock and scree to reach the Bealach na Lice between Bruach na Frithe, on your right, and Sgurr a' Bhasteir, on the left. Above is the hugely impressive Basteir Tooth and, behind it, Am Basteir. It's worth making the short detour north out on to Sgurr a' Bhasteir at this point. 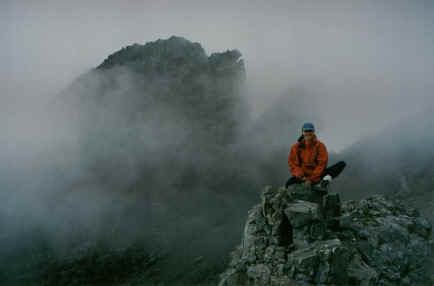 A narrow, rock ridge extends north to the summit cairn where extensive views can be enjoyed over Loch Sligachan and the Red Cuillin to the island of Raasay. The pinnacles of Sgurr nan Gillean are also seen and the true spectacle of Am Basteir can be fully appreciated from here. Head back to the bealach and a path skirts across the scree to the base of the final stretch of ascent. The climb on to Bruach na Frithe presents no problems, although there are a couple of rocks to clamber over before the top is reached. This mountain boasts the only trig-point on the main Cuillin ridge. If there's no cloud and mist (something of a rare occasion on Skye) you can view most of the main Cuillin ridge stretching away to the south. To the east is Bla Bheinn and, below it, Loch Scavaig with Elgol in the distance. For the descent, the north-west ridge offers an interesting alternative to simply going back down via Fionn Choire. A path leaves the top and skirts along the left hand side of the shoulder. There is nothing at all difficult if this is followed. Lower down, the ridge broadens out and, if it's clear, the best bet is to bear right to rejoin the path taken earlier in the day up into the coire and follow this down to meet the main Bealach a'Mhaim route. A fine way to round the day off is to stop off at the Sligachan Hotel bar and enjoy a pint or two of the local Red Cuillin brew. Map OS Landranger sheet 32. Start/parking Sligachan Hotel. GR: 486298. Grading As the only Cuillin peak not protected on all sides by steep cliffs, Bruach na Frithe is a straightforward ascent suitable for experienced hillwalkers. No scrambling or rock climbing is required. Care is needed in poor visibility, however. Sheep grazing in the coire means dogs should be on the lead.